Since its creation in 2003, Abacaus Marine has become a renowned shipyard specialized, exclusively, in the construction of luxury yachts. Based in Italy, the company now enjoys an international repute and is classified among the top 10 builders of luxury motoryachts worldwide. 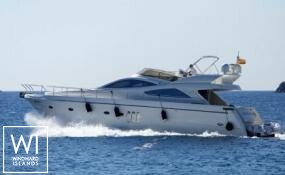 The success of this Italian building company is due to the perfect combination between high level performance, comfort, functionality and latest generation design such as Estelada, the Abacus 61, available for yacht charter in Balearics and Barcelona.